In a telephone interview in mid-April in Vancouver, British Columbia and in his new book, Collapse of Dignity, Napoleon Gomez Urrutia, president of Mexico’s National Union of Miners, Metalworkers and Steelworkers, known as Los Mineros, reveals the government and business rot in detail. 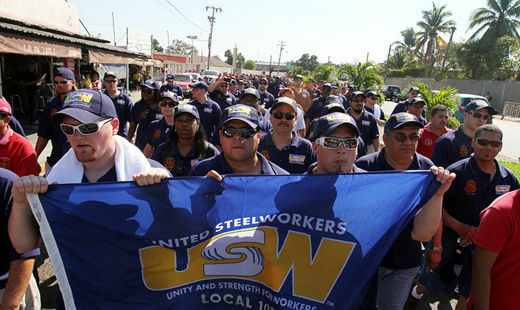 The Los Mineros saga also makes the Mexican miners’ leader one of only four heroes for United Steelworkers President Leo Gerard, and an internationally respected union leader. 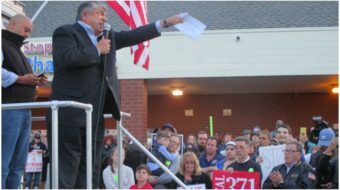 The AFL-CIO honored Gomez Urrutia with its 2011 human rights award. 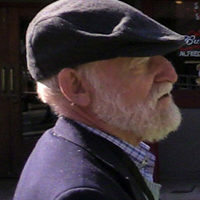 Gomez Urrutia’s exposure of the state of Mexican workers and unions – and government hostility to independent unionism – is important to U.S. workers as well. That’s because, studies show, the advent of the North American Free Trade Agreement (NAFTA) 15 years ago threw millions of Mexican workers out of jobs. Lacking independent unions and a voice on the job, they had few alternatives. One alternative, which many took, was to flee to the U.S., seeking work here. For years, Mexico’s government-recognized labor federation worked hand-in-glove with the Institutional Revolutionary Party (PRI), which ruled Mexico from 1929-2000. Workers had no independent voice, on or off the job. In the 12 years since, the right wing pro-business National Action Party (PAN) held the presidency, until PRI won it back this past July. But the corruption continued, as PAN presidents privatized industries and teamed up with conglomerates to try to crush independent unions, notably Los Mineros, Gomez Urrutia said. A smaller independent union of telecommunications workers has also been a government target. The government’s schemes against Los Mineros escalated after the union campaigned first for the rescue, and then for the recovery of the bodies of 65 miners killed in an explosion at the northern Mexican Pasta de Conchos coal mine in 2006. Mexico, was more interested in covering up the disaster than in solving the problems, Gomez Urrutia said. Grupo Mexico sealed the mine just five days after the blast. In its schemes to destroy Los Mineros, the PAN governments worked closely with Grupo Mexico, Gomez Urrutia explained. Other government measures included forcing Gomez Urrutia into exile, trying to bribe him to step down and stop his opposition, and trashing the union’s headquarters. Gomez Urrutia has been living, with Steelworker help, in Vancouver, and leading his union from there, for the last seven years. The government also tried every legal trick in the book to convict him on trumped-up charges, deprive him of the Los Mineros presidency he overwhelmingly won twice, and send him to jail. And the government has lost in every Mexican court, at every level, Gomez Urrutia and his lawyers report. It even complained to the international police agency Interpol, which investigated and reported Gomez Urrutia was absolutely clean. The book details secret meetings between top Mexican government and corporate officials about how to take over Los Mineros and install puppet officers. It also recounts a 2007 meeting between Fox, two of his cabinet officers – including the Labor Minister — and Humberto Moreira, governor of the Mexican state of Coahuila. Fox virtually ordered Moreira to find some trumped-up charge to use to arrest Gomez Urrutia. That would let the government remove him as Los Mineros president. “Finally, they parted, with President Fox telling Moreira to keep quiet about the discussion. ‘You never keep your mouth shut,’ Fox told him. ‘With all due respect, neither do you,'” Moreira replied. The point of the book, the press conference and the Fox-Moreira discussion, was to detail government complicity with corporate interests. But Collapse of Dignity also exposes those interests’ own corruption. During the press conference, Gomez Urrutia described a scene in the Grupo Mexico offices shortly after the fatal mine blast, with the conglomerate’s board sitting and laughing, until he walked in. When he demanded answers about why there was no investigation of the explosion’s causes – and no effort to recover the miners’ bodies — he was met with embarrassed looks and mumbling. Harking back to the explosion itself, Gomez Urrutia added in the book that, “Our colleagues were either dead or trapped in the complete darkness of a collapsed mine.” He said that as miners’ union leader, he was “enraged and absolutely helpless,” cursing the mine owner and remembering how many times that Los Mineros’ own health and safety committee had warned the owners about the disaster waiting to happen. Now that all the legal battles are presumably over, and Gomez Urrutia and Los Mineros have been cleared, the union is on the offensive, in organizing other mines and in Mexican courts, he said. Los Mineros is suing officials and individuals responsible for the conspiracy to trash the union and jail him. And he plans to return to Mexico, as soon as a travel visa comes through; Gomez Urrutia is now under Canadian protection. Napoleon Gomez – Interview at International Labor Congress from Scott Marshall on Vimeo.